"Alex Virot - The Voice of the Tour de France"
It is not often that a simple item of Sports Memorabilia spawns not one, but two documentary-style videos. 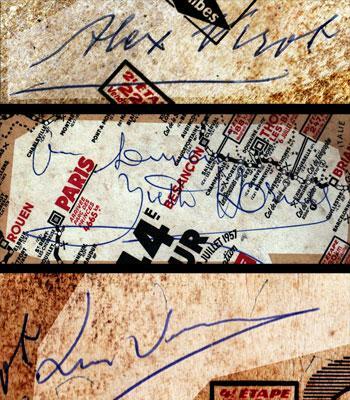 The 44th edition Tour de France Media Guide [below left] did just that; thanks to the three autographs [below right] on the front cover. As well as a unique sporting perspective, this vintage journalist's reference booklet full of race and stage details also spawned a tragic human interest story. With the help of Eurosport's cycling expert Felix Lowe, we slowly uncovered a touching tale of two-wheeled tradition, triumph and tragedy. In the following two videos, Uniquely Sporting's Colin M Jarman and cycling author Felix Lowe look at the history & characters behind an intriguing item of vintage Tour de France memorabilia. 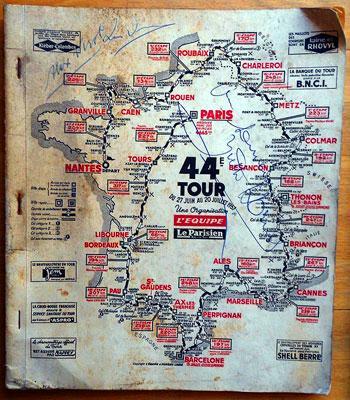 The 1957 TDF Media Guide provides a number of interesting facets of Tour history with a tragic human twist.